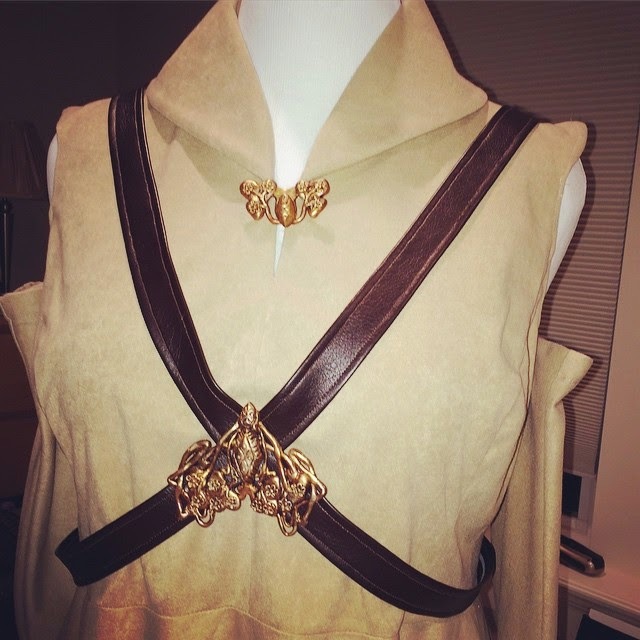 I made Padme Amidala's Mustafar "sleeveless" costume for Emerald City Comicon 2015 in 23 hours over 4 days. 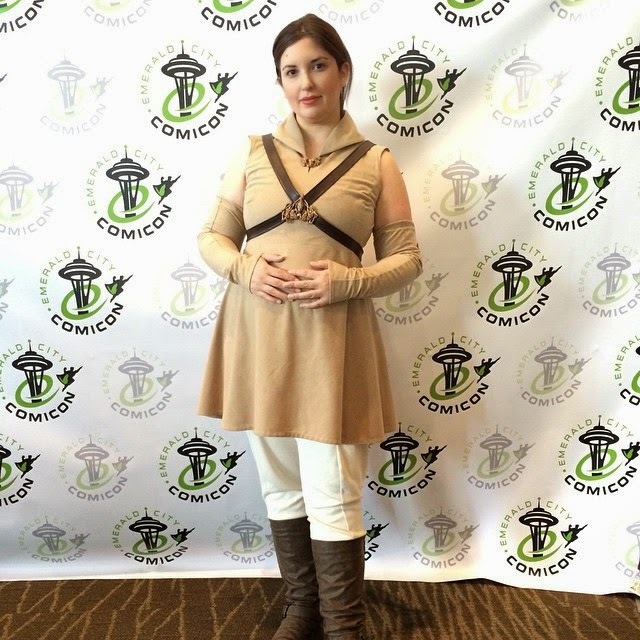 I wanted to share tips on how I made it because it is a very comfortable maternity outfit, a great cosplay option for pregnant mamas! - I had little to no experience making pants, and no patterns! I couldn't find the right leggings at the mall on short notice, so I was going to have to figure out how to make them. - I made the entire outfit for a Total Cost of $25.25. It was a last-minute decision to tackle this project but I am so glad that I did! SmallRiniLady and I were presenting a cosplay panel on Friday and I felt it was necessary to wear a costume but I couldn't wear my old costumes since I was 5 months pregnant. 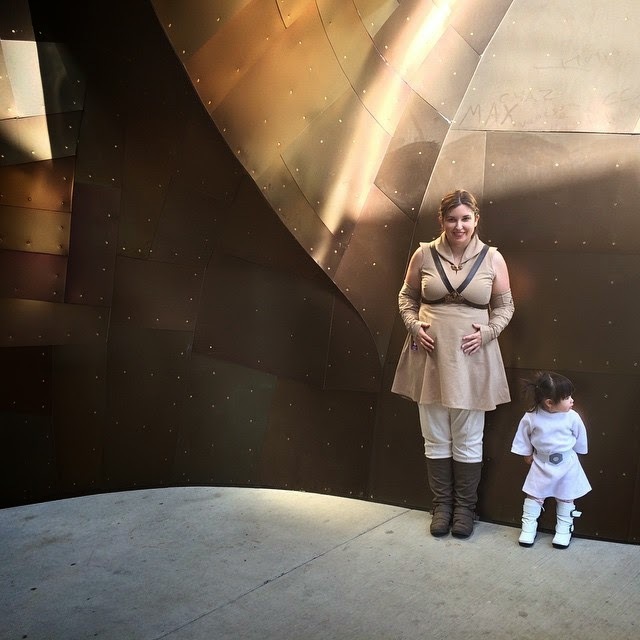 Padme in Star Wars III: Revenge of the Sith was my natural choice for a recognizable pregnant character; my first cosplay was Arena Battle Padme from Star Wars II: Attack of the Clones, so this was like coming full circle. I started by doing an image search on Google and Bing, using my smartphone. Then I found amazing close-up detailed reference photos on padawansguide.com . I saved all of these images to my smartphone, then uploaded five essential images to the Cosplanner app so I could easily find them again. 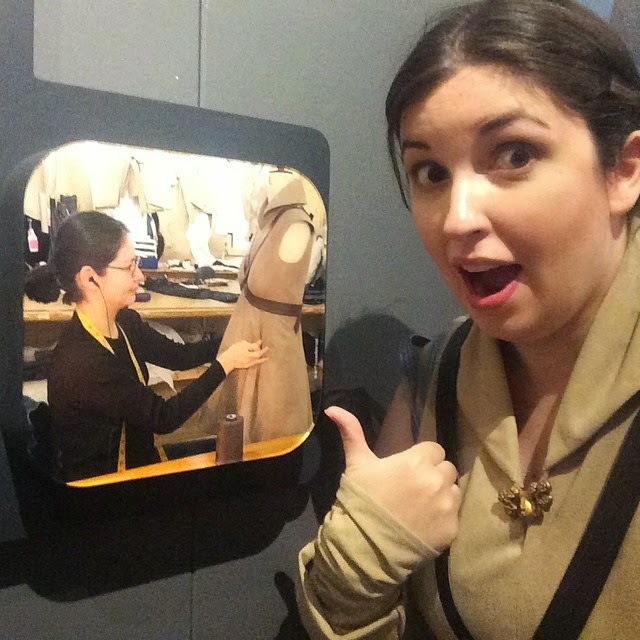 This is a picture of the ACTUAL MOVIE DRESS being made! Material for the harness: Dark brown leather or faux leather (I bought 8" of 60"-wide $35/yd synthetic leather from the home decor department) - you actually only need about 4" or so at 60" wide. 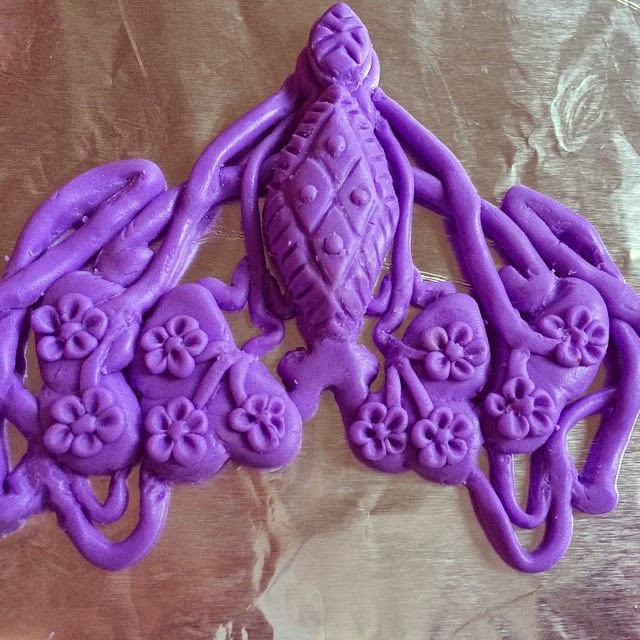 Fimo (moldable plastic clay like Sculpey that you harden by heating in the oven) for the filigree details on the broach and harness "buckle". On the Sunday before the convention I found all of my fabrics at JoAnn's. After a moment's hesitation at the cutting counter (can I REALLY get this done before Friday? ), I took the plunge! - Disclaimer: this is the total amount that I spent this week on this costume. I did not count in the price of the boots I already had ($35), the Fimo that I already had (I think I bought it for $2 on clearance 6 years ago), or all of the tools I used which I already had (sewing machine, serger, thread, needles, elastic, fusible interfacing, tailor's chalk, markers, pointy stick tool for detailing the Fimo, paintbrushes, acrylic paints I already had, hot glue and glue gun, oven, the craft room and tables in my house, etc.). Monday I started sewing the dress. Breaking down the construction I planned to make the top first, with seams to shape the bust. I found a jacket pattern (Simplicity 2207) in my collection that would do. I used the front and back pieces, chopped them off at the waistline (the dress has an empire waist) and excluded the sleeves. I left some extra fabric at the tops of the armholes to account for the shape of the fabric coming over the shoulders. Then I sewed the top pieces together according to the instructions in the pattern. In the interest of saving time, I did not put lining in the dress. My method is to try it on (inside-out), pin it strategically, take it off and adjust the pins slightly, smoothing the fabric, then try it on again to verify that works, then sew it. I use both a serger and a sewing machine. 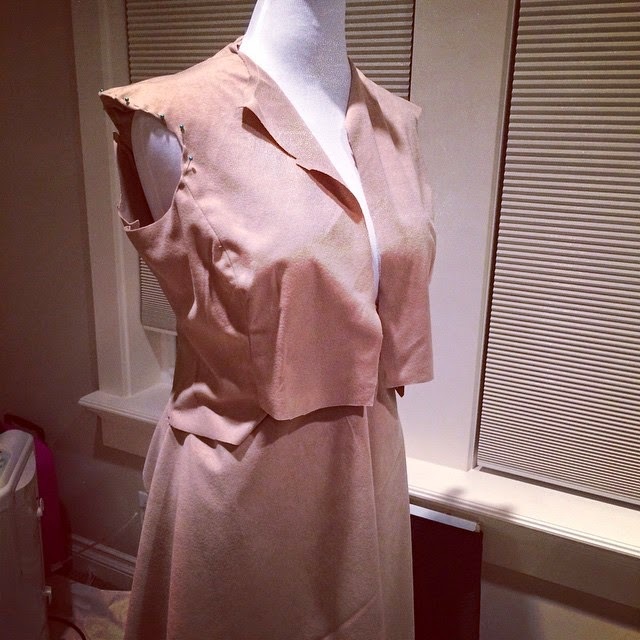 Here all I have done so far was sew together the Simplicity 2207 jacket pieces. Next, I sewed up the front, leaving enough of a V-neck to fit my head through (this would be pinned together with the broach later). Then I finished the armholes with a rolled hem. After that it was a matter of draping on a skirt, drafting a collar and hemming everything. 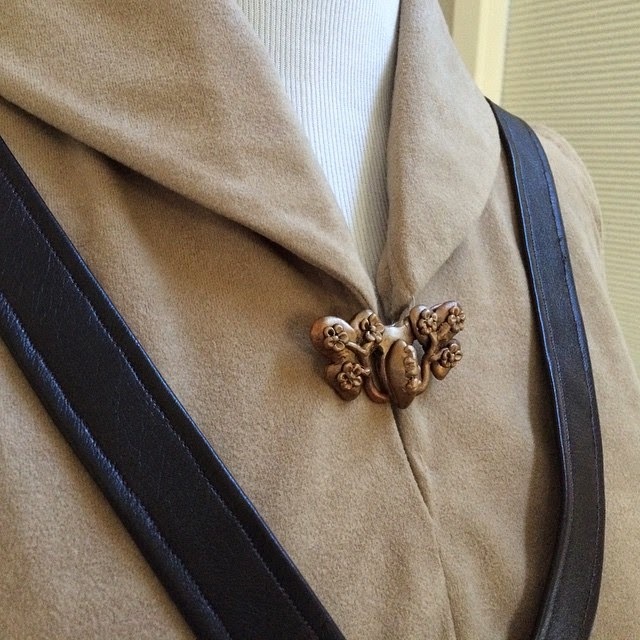 The collar was the most complicated part; I started with the bottom edge of the pattern that came with the Simplicity 2207 jacket pattern, traced it onto pattern tracing material and made it into the larger rounded shape I wanted. 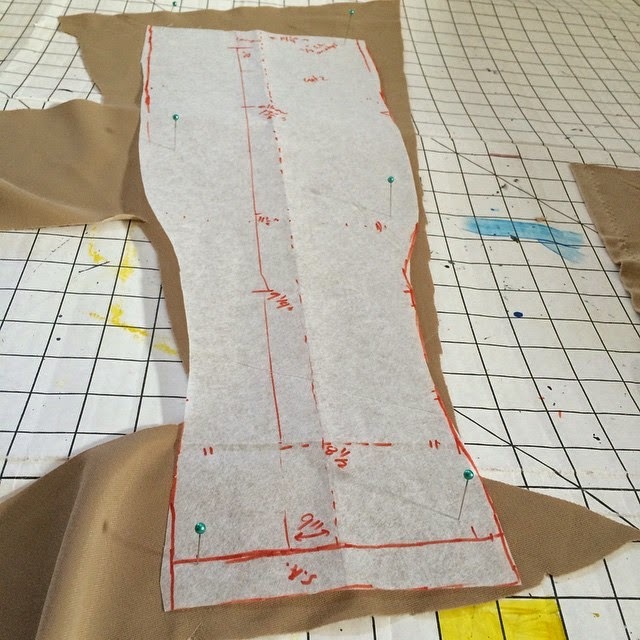 The skirt part is pretty straight-forward if you have had a little bit of experience making dresses or skirts. I made the skirt with two pieces (front and back), attached it to the jacket at the high "empire" waist, fitted the front draping over my baby bump, pinned down the side edges perpendicular to the ground, sewed it on, and turned under the bottom edge to hem it. For the finger-less opera gloves, I created my own pattern, designing one sleeve as two pieces sewn together, the seams running from hand to bicep. Squeezing a glove pattern piece onto fabric remnants! I measured the length of my arm from where I wanted it to start and end, plus extra length for a rolled helm at the hand and elastic casing around the upper arm. Then I started measuring the circumference of my arm at various points, making sure my thinnest point at the wrist would still be big enough to fit my hand through. I cut my four fabric pieces out of the scraps from my dress (I barely had enough because I forgot to account for the gloves, whoops!). For the leggings I styled them after my favorite super-comfy maternity leggings from Loved by Heidi Klum. 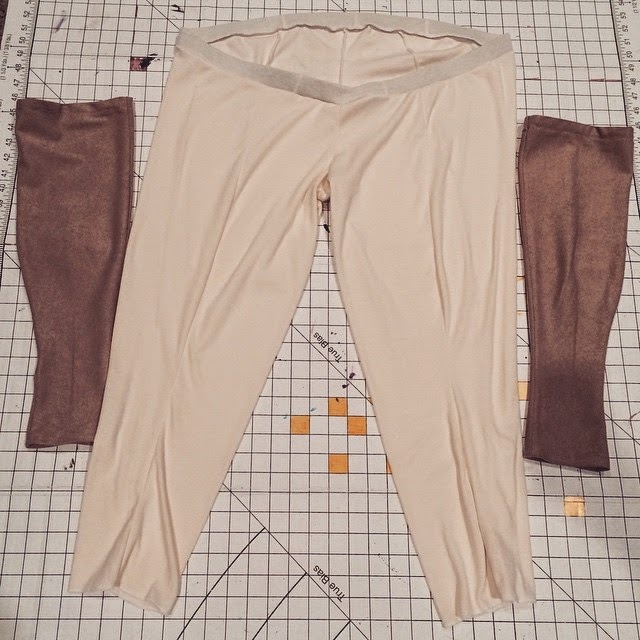 But Padme's leggings have vertical seams up the center front and back of the legs, not at the side seams, so I couldn't just trace existing pants and I had no patterns that would work. I needed to figure out how to make these by myself. So to make the pants I cut my fabric in half (one piece for each leg) and cut the U shape for the crotch area center seam first. I just grabbed a random pants pattern in my size and traced the U shape for the center seam, putting together the front and back pieces. I left enough room to wrap around the front of my leg but kept the back bigger so it could wrap around the back and meet the other edge at the center front. I stitched the U's together then pinned the fabric to my clothes to drape the legs. It was a matter of pinning at the widest point, letting the fabric hang straight, then pulling it tight to follow the curves of my body and pin as I go. I made a waistband of a straight strip of fabric in a tube around elastic, then pinned it to the top of the pants keeping it high in back and low under the belly in front, overlapping the front edges in a V with the ends disappearing. I gathered the top edge of the pants to fit it to the waistband. For the brown Sleeve Emblem I saved time by painting it on instead of embroidering. Note that the emblem only appears on Padme's left arm (yay, I only have to do this once!). Now, if only I had remembered to buy fabric paint! I made a quick trip to Wal-Mart in the middle of the week and discovered there was no brown fabric paint! So I bought black puffy paint instead (no time for a trip to another store!) and decided I would use some brown acrylics I already had at home to brush on top of the black. I drew the emblem onto paper by hand (it took three attempts to get the size and shape right), then cut it out to use it as a stencil. I put paper between the two layers of fabric to prevent bleed-through of the paint, positioned the stencil, roughly brushed on the black, removed the stencil and finished off the edges and small details by hand. First I brushed black fabric paint onto the left sleeve and let it dry overnight. After the fabric paint dried overnight, I dry-brushed dark brown acrylic over the black fabric paint. Then I used a lighter brown to brush on highlights, assuming a light source would come from above. 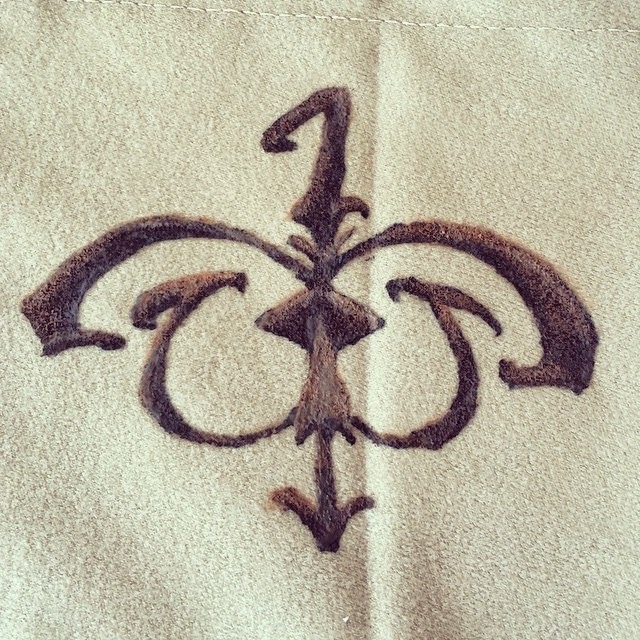 This gave the effect of embroidery and was very quick and easy to do! 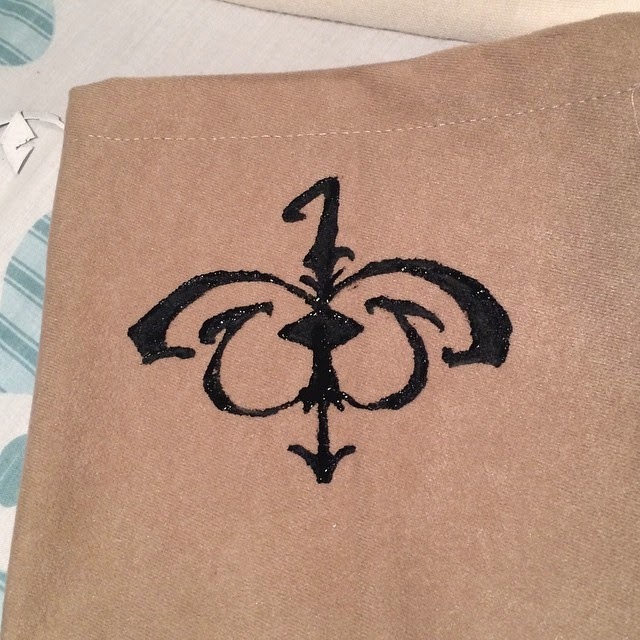 Here is the final emblem, with the brown acrylics over black puffy paint, brushed onto suedecloth. 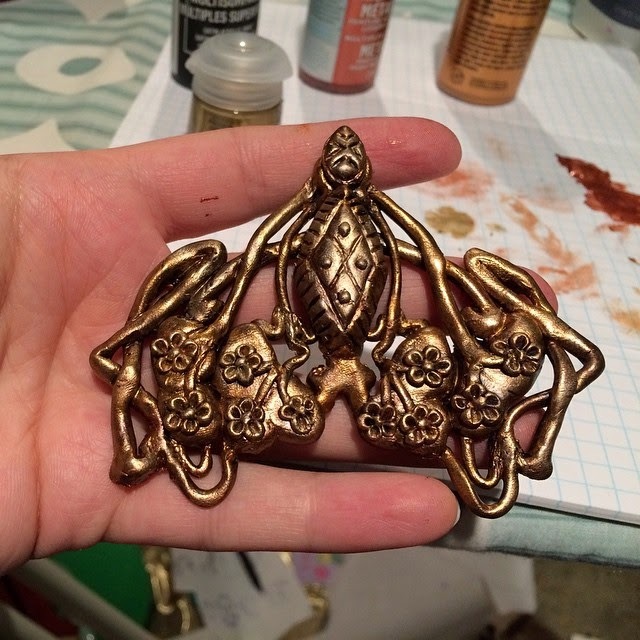 Lastly, I made the broach and buckle filigree pieces. 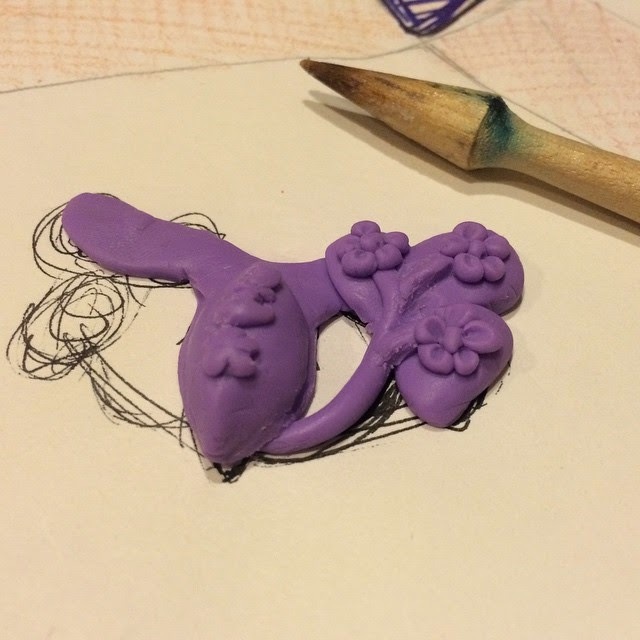 I haven't worked with Fimo very much, so I started with the smaller broach, hoping it would be a success. Worbla would not have been a good choice of material; it isn't very smooth and I wouldn't be able to get such tiny, fine details with it. I needed something flexible yet sturdy so it wouldn't just break apart halfway through a convention day. Metalwork is not in my repertoire, so Fimo seemed to be a good choice (it was!). The first step was to bring up close-up reference images and sketch the designs onto some paper, at scale. 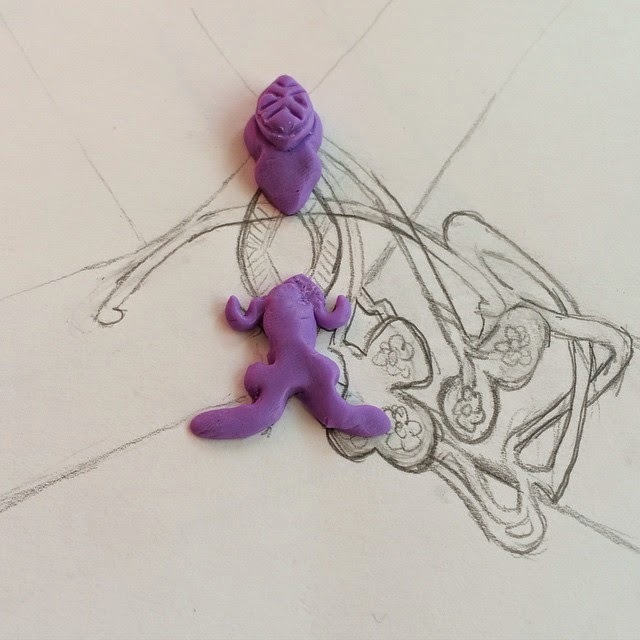 Then I could start forming the Fimo by hand right on top of my sketch, working from the bottom up. I tried to give it extra thickness and weight where I could, to make the delicate pattern more sturdy. After the Fimo hardened in the oven, I primed and painted it (I may have forgotten the primer!) using black acrylic as a base; then I layer Copper over the black, and Royal Gold on top, with another shade of gold dry-brushed on in areas. The mixture of metallic colors gave it an aged, dimensional look. I hot-glued the buckle onto a pin-back and pinned it to the dress to close up the V-neck below the collar. I repeated the whole process with the buckle for the harness. I actually sewed the two straps together in an X, then I traced the straps onto my paper first so I would be able to make the "buckle" fit the straps correctly. I only drew one side of the buckle since it is symmetrical. After I finished making the buckle (I think this took 1-2 hours), I carefully peeled it off my paper and transferred it to tin foil on a cookie sheet. Then into the oven it went! Fimo buckle, ready for the oven. The finished "buckle" for the harness. Lastly, I attached the buckle piece to the harness using hot glue in three places. The hot glue held up pretty well. It did start to peel off in two places on the first day; I hot glued it again at the Cospitality Lounge and it stayed put through two and a half more days. I would rather have it peel off the harness than break apart in the middle of the filigree; that it one big reason why I used hot glue to attach it. I am super happy with how my costume turned out! 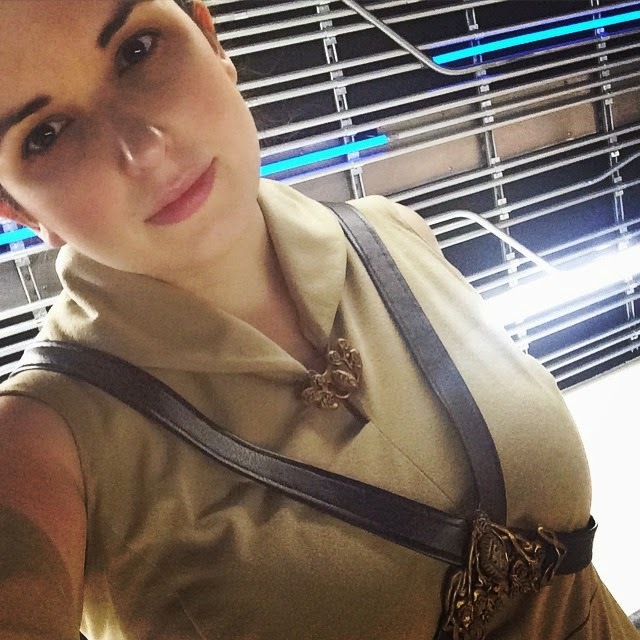 I wore it to ECCC 2015 on Friday and Saturday, and then I wore it again to the Star Wars Costumes exhibit at the EMP/SFM in Seattle on Tuesday. are you willing to sell your costume? Sorry I'm not ready to part with it yet! Would you make me one? I'd pay you?? I'm very very very serious! I would love to pay you if you could make me one as well. If you are interested to talk you can contact me at kristentedeschi@yahoo.com. Thank you for you help! My costume turned out better than I had hoped for! I wish I could post a picture of it for you!!!! I'm working on my own version and your notes are incredibly helpful. Thanks so much for posting so many links and details about your process. I couldn't do it without this post!! You're welcome! Do you have pictures of the finished costume? I'd love to see yours! Sorry for the late reply (I'm not getting alerts for comments, whoops!). I'm not really doing commissions right now, I have my hands full! Hello, I'm very interested in making this costume, or possibly paying you $100 or so to make and ship it to me. I'm will be 32 weeks by Halloween and if I try to make this myself it would be disgraceful to Star Wars hahaha. Plus I don't have any of the tools (or even know what some of those things are!). Please let me know if this is something you're willing to do! Sorry I am not taking commissions at this time. Good luck! Try your local tailor so you'll be able to drop in for fittings. How long did you put the clay in for? Follow the directions on the package! I think this clay only took 30 minutes. How do you attach the straps on the back? You said you pinned them and sewed them later but if you permanently stitched them to the shirt, than how did you get the shirt on? I'm in the middle of trying to make this costume but I have no idea how to attach the straps. Any extra help would be amazing. Thank you! Hope you figured it out! I stitched the straps down in one place right under the bust and then just wiggled into the top. The stitches are easy to remove in case I want to detach the straps and throw the dress in the wash. Stunning!!! So beautifully done. I love the mother daughter pic. Hope your new little is doing well. Thanks for the post! Are willing to sell this costume? I am currently pregnant and would love to wear this for a Halloween party we have coming up!